Twitter has become very popular in a short amount of time. 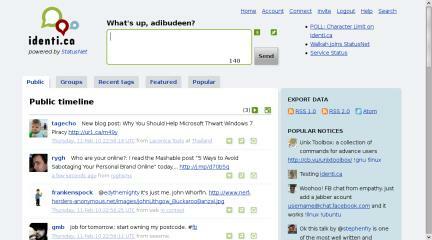 With it, users can post short updates about what they are currently doing, working on, thinking, or viewing/accessing. For businesses, it is a good way to communicate with others who might not be in the same office or even the same city or country. The downside to this is that Twitter is used by so many others for other purposes, and users are often inundated with requests. Running a micro-blogging server of your own might be very appealing, particularly if you only need it for a company’s business and do not want outsiders to view it. While hosted solutions like Twitter offer privacy options, you would still be trusting your security to a third party. StatusNet is a free micro messaging platform that powers the also popular Identi.ca. You can host it on your own domain, share files, create groups, add plug-ins and applications, and access it via both desktop computers and mobile devices. It is a PHP application that stores data in MySQL databases. StatusNet is free software released under the GNU AGPL and is available for download directly from the project’s website.